The Freistadt Danzig (Free City of Danzig) was proclaimed by the League of Nations on November 15, 1920. A new constitution was drafted for the new sovereign city-state, providing for a legislature composed of a senate and a popular assembly, though the city-state actually remained under control of the League of Nations throughout its existence. The president of the senate served as the de facto chief executive of the new state, but actual executive power was wielded by the High Commissioner, who was chosen at intervals by the member states of the League of Nations. The ten pictorial definitive stamps shown above (Mi. #53-62, Sc. #49-58) were issued on January 31, 1921 to celebrate the the new constitution of the Freistadt Danzig. These new stamps were typographed, serrate rouletted 13 1/2, and the paper was watermarked with a honeycomb pattern. The designs feature a Hanseatic Trading Ship, symbolizing the historical importance of the port city of Danzig as a major Baltic Sea trading center. The 25 Pf., 40 Pf., and 80 Pf. 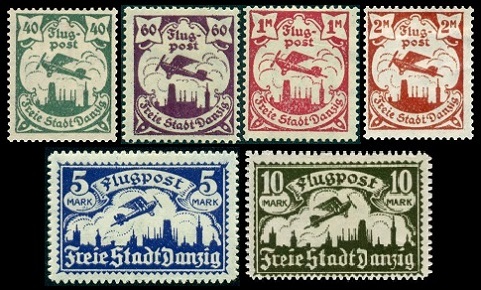 denomination stamps from this set were re-issued on March 11, 1921. The re-issues (Mi. #63-65, Sc. #59-61) are perforated 14. All of the stamps in this set are also known imperforate and part perforated, though they were not officially issued in that manner. The six new airmail stamps shown above (Mi. #66X-71X, Sc. #C4-C9) were issued between May 1921 and May 1922. The designs of these new airmail stamps feature a monoplane above a silhouette of the city of Danzig. They are typographed and watermarked honeycomb. The 40 Pf. - 2 Mk. denominations are perforated 14, and the 5 Mk. - 10 Mk. denominations are serrate rouletted 13 1/2. These stamps exist imperforate and are not terribly expensive. These stamps also exist with sideways watermarks. The stamps with the sideways watermark (Mi. #66Y-71Y, Sc. N/L) are considerably more expensive than those with the normal upright watermark. 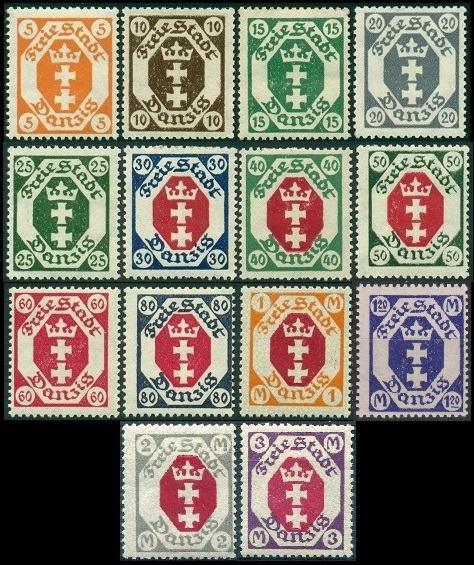 The fourteen new definitive stamps shown above (Mi. #73-86, Sc. #63-76) were issued during 1921. These new stamps feature the Arms of the Free City. The Pfennig denominations are printed on white paper, whereas the Mark denominations are printed on white paper overprinted with a gray network. In some cases the network on these Mark values can appear very faint or actually be missing. All of the denominations were printed on paper with the upright honeycomb watermark, except for the 3 Mark, which has a sideways honeycomb watermark. They are all perforated 14. The three higher denomination definitives shown above (Mi. #87X-89X, Sc. #77, #79-80) were issued by Freistadt Danzig, beginning in August 1921. They feature the Coat of Arms of Danzig. These stamps are printed on paper with the upright honeycomb watermark, and they are serrate rouletted 13 1/2. The 1922 printings of these stamps (Mi. #87Y-89Y, Sc. N/L) have the sideways honeycomb watermark. They are about the same price as the 1921 printings with the upright watermark. The three charity stamps shown above (Mi. 90-92, Sc. #B1-B3) were issued on October 16, 1921 to publicize Tuberculosis Week. All three denominations feature St. George Slaying the Dragon. The 30 + 30 Pf. and 60 + 60 Pf. denominations are perforated 14. The 1.20 + 1.20 Mk. denomination is serrate rouletted 13 1/2. All of these stamps exist imperforate and they are reasonably affordable. On May 6, 1921, the overprinted 75 Pf. Germania stamp issue of 1920 was re-issued and revalued to 60 Pf. It is shown above (Mi. #72, Sc. #62). 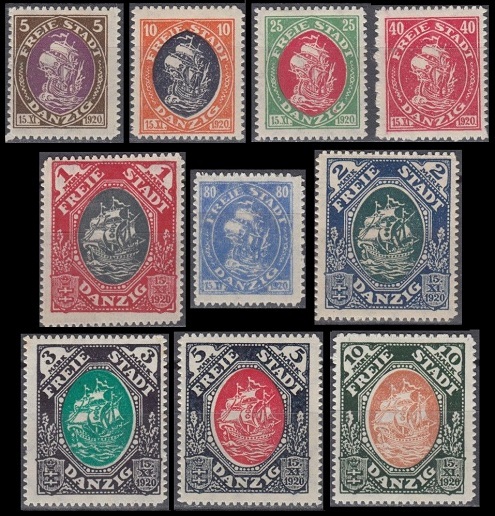 Pairs, with one stamp having the surcharge and the other missing the surcharge, are noted in the Michel catalog. They are very affordable.